Once you pick two end-points, the four modes’ routes are drawn with different colors. It’s been surprising to see how the routes vary depending on the mode. The program also gives you the total travel time and distance for each mode. For example: there’s a house on the market on Park Street; it’s Walk Score is 68. To get from my office to that house, I’d say that bicycling is a better choice than driving. (click to see full size) Simple. Colorful. Brilliant. 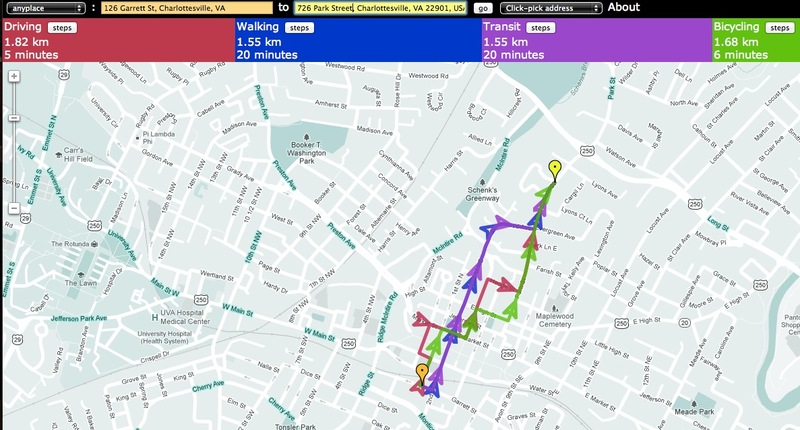 This is a fantastic research tool for homebuyers, sellers and folks moving to the Charlottesville area â€¦ keep in mind that the directions are likely mostly right as are the business listings â€¦ things change, and the best way to know if a route if truly walkable or bikeable is to walk or bike the routes you’d be doing. Sorry, but there’s no way to embed at this point. The map uses custom AJAX calls which wouldn’t work outside the native site. But thanks for the post, and glad you like the tool!